Knowing a whole lot of nothing about the place, we decided to stop for two nights in Memphis, Tennessee. Obviously we knew that’s where Elvis lived and there’s a lot of music history there but that was about it. The place looked almost deserted when we drove into town. Our hotel wasn’t far from the office blocks of downtown and also not far from Beale Street, which Paul (our friend from Natchez) had recommended for music. It’s the Memphis equivalent of Bourbon St in New Orleans, but much quieter – or at least it is on week nights. Bourbon Street wasn’t quiet any night of the week that we could see – and you’d even find people bar hopping any time of the day too. Beale Street seemed much more clean and sedate, although I’m sure it gets lively on the weekends. We’d been told to try out the bbq food and I didn’t have to be told twice. BBQ ribs are just about my favourite food in the whole wide world (although my mum’s hamburgers are up there) so Luke summoned the powers of the internet and got some recommendations. 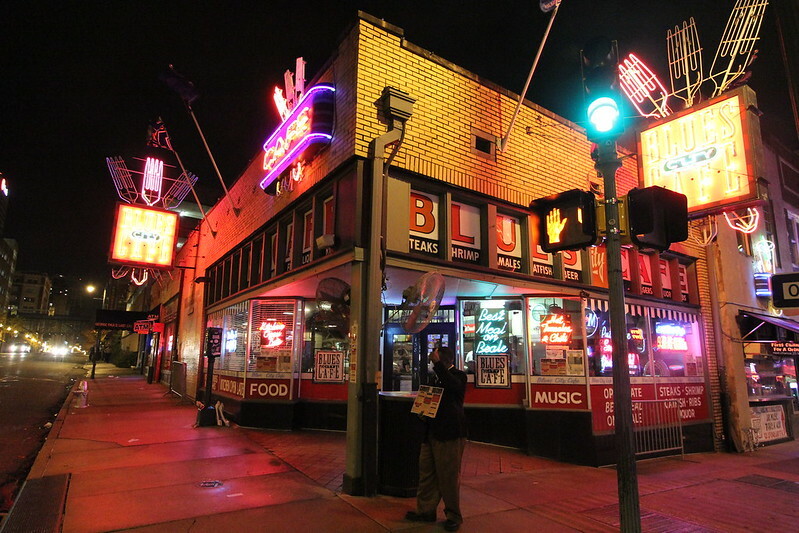 On the first night we stopped at a rather gritty diner called The Blues City Cafe. It was moderately busy and the air was a little smokey from all the cooking. We ordered a full rack of ribs to share (see? Learning!) and they came with ‘steak fries’ (which are slightly larger cut chips), a little tub of coleslaw and some bbq baked beans. The beans were a surprise – I didn’t realise they were a thing over here. The ribs were excellent – on par with the City Grill Room ribs at home and probably had more meat on them than the CGR ribs normally do. We ended up having a fairly early night… after a few episodes of Star Trek on the laptop, of course. I was hoping to find some more rockabilly style clothing, so after a hearty breakfast at the diner Elvis used to frequent, we looked in a couple of shops but to no avail. I did buy a few new pairs of leggings at American Apparel as mine are all starting to wear out. You don’t realise how quickly clothes fall apart until you’ve only got three day’s worth of outfits. In the afternoon we walked from our hotel to Sun Studios, the label that first signed Elvis, as well as Roy Orbison, Jerry Lewis and a host of other stars. While people take tours (pretty short, underwhelming tours) of the studio during the day recording still happens there in the evenings. If you’re a fan of rock and roll history it’s no doubt worth the trek but otherwise it’s not terribly exciting. The tour visits one room of memorabilia and then the recording studio where you listen to snippets of various people speaking and singing. 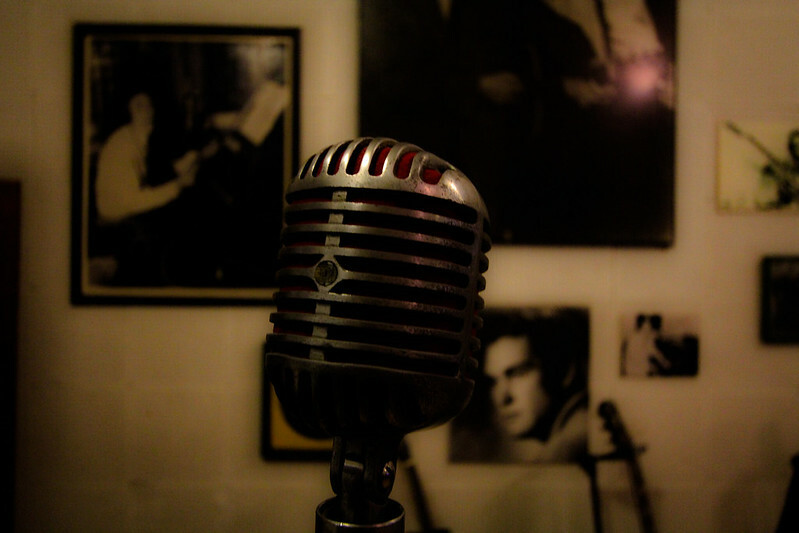 The mic used by Elvis. 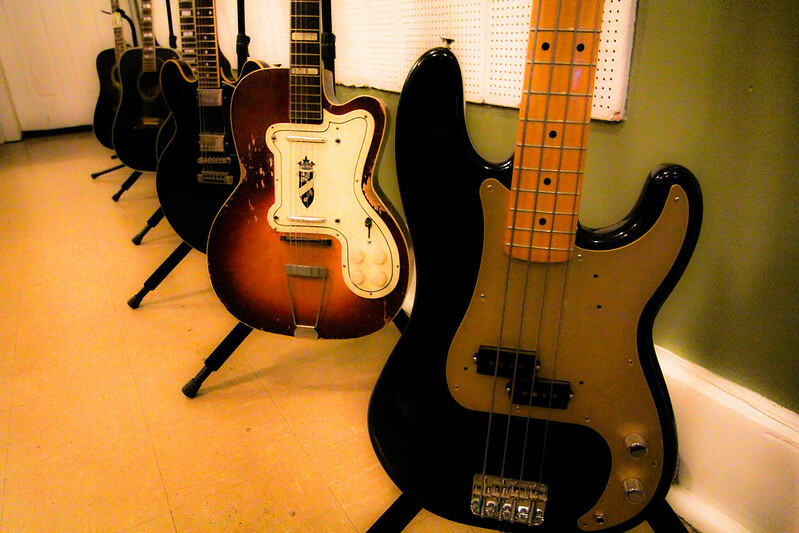 The guitars used by artists. 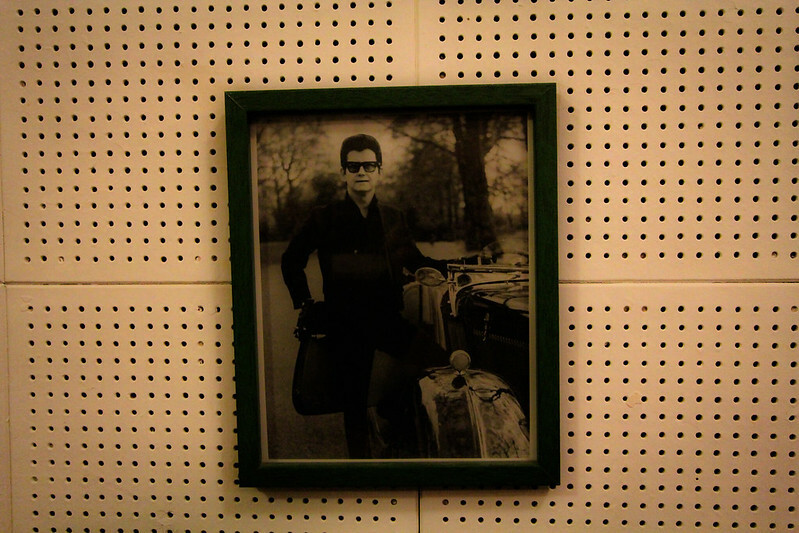 One for Mum – a photo of Roy Orbison. One of the most famous photos in the history of rock and roll. Carl Perkins, Jerry Lewis, Elvis and Johnny Cash. Notice that the background of the photo is the wall that the photo is hanging on. 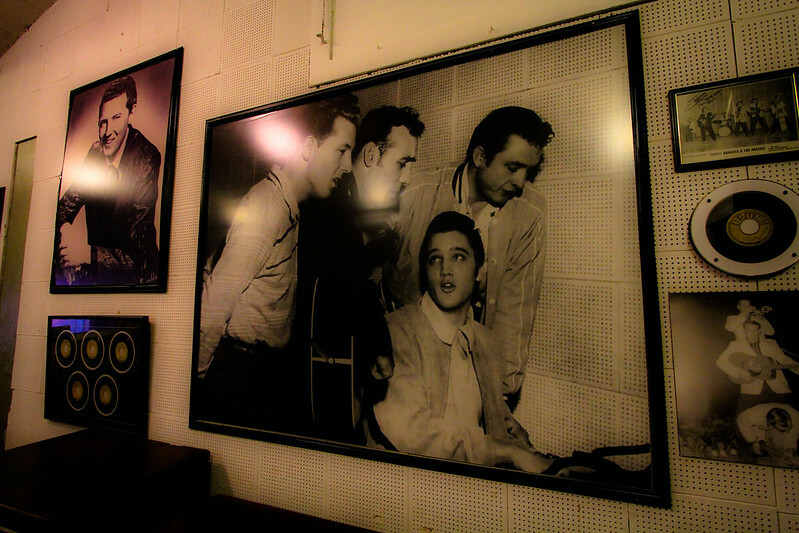 After the tour I looked up one of the musicians in the photo with Elvis, Carl Perkins. I didn’t realise it was he who had written ‘Blue Suede Shoes’ and the story behind it is interesting. It was Johnny Cash who had told him it would be a good theme for a song as the shoes were fashionable at the time. The song became huge but Sam, the owner of Sun Records, passed on less than half the money Carl was entitled to. As a young, fairly uneducated man with no idea he didn’t question the money and it was only years later, after he was unable to legally claim it back that he discovered he’d been ripped off. The studio tour idolises the owners for supposedly inventing rock and roll but they did not deal honestly with all of the clients who made them rich. 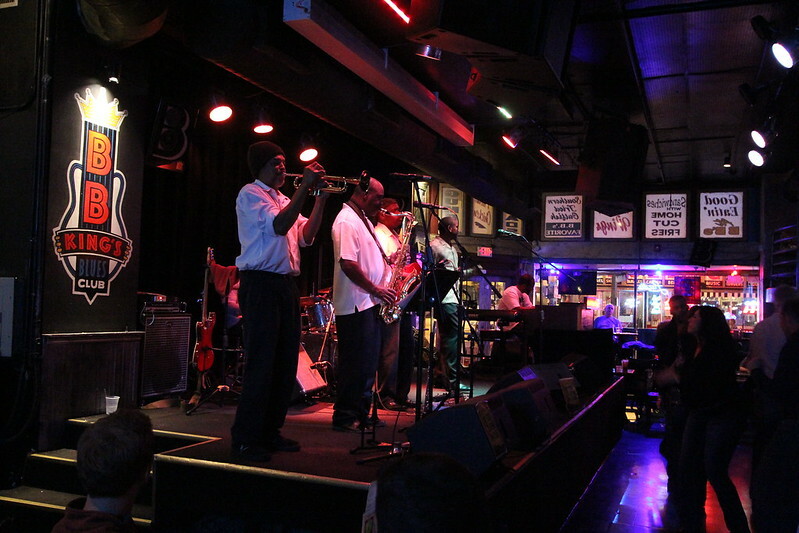 We went to a different restaurant in the evening – another place on Beale Street. I can’t remember the name but it had a pig on the sign. The ribs there were also good but we both agreed that we liked the first place better. After dinner we walked up to BB King’s Blues Club. I didn’t realise that BB King’s name actually comes from ‘Beale St Blues King’ – and he’s still performing over 200 shows a year now in his 80s. Pretty impressive! The club was fairly busy and full of energy. People were actually dancing, which we hadn’t seen much of in New Orleans, and we’d have gotten up too – if we hadn’t ordered drinks and then only caught the last 3 songs of the set. Still, it was a great vibe and we contemplated stopping somewhere else on the way home but then settled for an early night as it was a 5 hour drive to St Louis the next day. I don’t know who the band were, but they were good! I don’t know if I’d recommended Memphis as a destination unless you’re a music geek, but it was certainly a lot warmer than St Louis. More on that later! I’ve got a friend who’s heading there from Australia in a few weeks – I’ll pass on you tip! I had no idea it was so violent but it certainly didn’t give off that vibe to us:).